I have been canning for 40+ years and let's just say that I started early! I find it very relaxing and I still enjoy the "popping" of the jars as they seal......success! I have some items that I make each year but I also enjoy trying new recipes. This year I decided to put together some recipes of my own. I now offer you the "regular" jams, jellies & butters but also some new & unique combinations to enjoy. All will also make great gifts and the 8 oz. jelly jar is just the right size to fit into a stocking December 25 or a day during Hanukkah - also a great idea to give to someone that simply has everything but still enjoys homemade items, think ahead & order! Keep checking this page to see the new jams, jellies & butters that I make throughout each season! Apple-Pear Jam - SOLD OUT! Apple Cobbler Jam - SOLD OUT! Apricot Jam - SOLD OUT! Apricot-Pineapple Jam - ALMOST GONE! Apricot-Pineapple w/Unsweetened Coconut Jam -ALMOST GONE! Blackberry Jam - 4 BATCHES MADE IN SEASON, 2018! Blueberry Jam - This year I made my own recipe: Blueberry Bliss, won 1st at local farm show! ​ blueberries, strawberries & raw coconut...delicious! Cherry Jam - 1 LEFT! Cherry Nut Jam (w/almonds & pecans) - SOLD OUT/thanks Jay! Gingered Plum Jam - 1 LEFT! Grape Jelly - ALMOST GONE! Mango Jelly - SOLD OUT! Peach Jam - SOLD OUT! Peach Cobbler Jam - SOLD OUT! Pear Jam - ALMOST GONE! ​Pearadise Marmalade - 3 BATCHES MADE FALL 2018! Plum Jam - ﻿ALMOST GONE! Raspberry Jam - SOLD OUT! 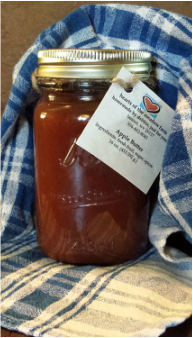 Rosy Peach Banana Jam - Again, a delicious blend, 2 batches! Strawberry Jam - ALMOST GONE! Strawberry-Banana Jam - 1 LEFT! Triple Berry Jam (Strawberries, Blackberries & Blueberries) - 2018! Apple Butter- 2 1/2 batches made 9/25/2018! MORE SOON! Apple - Pear Butter - None! Apricot Butter - 1 LEFT! Banana Butter w/Spices - GETTING LOW...same as Apple but bananas! Fruit Butter - 1 LEFT! Peach Butter - 2 kinds, one w/spice & one w/o spice! Pearadise Marmalade - 2 pints! Triple-Berry Jam (Strawberries, Blackberries & Blueberries) -1 PINTS LEFT! Please check back to see the new items, the list changes as the inventory is sold. If you waited too long and "Sold Out" shows beside what you were "thinking about", you may need to contact me to see if I will be making more this year - or place an order for next year. I will need a 50% deposit on any order placed for the following year - if more than 6 jars of one item are ordered. This is held until the item is made, paid in full and mailed or delivered to you! This only protects your order from being sold but it also protects me and hopefully will at least cover my costs? Shipping will be via USPS/Parcel or Priority unless you want to pick-up your order or arrange a spot to meet and I will make delivery - this will be discussed when you place an order.